On entering the White Lion in St Albans it was noticable that they had an unusual selection of ales that included Black Sheep, Skinners Cornish Knockers and Bath Ales Barnstormer. The White Lion actually has Black Sheep bitter and Youngs Special as their standard ales plus four ever-changing guest ales. It dates back to the 16th Century and won CAMRA Herts South Pub of the Year 2006. This pub is another one that is dominated by men but the age group was younger than the nearby White Hart Tap or the Garibaldi. Most visitors to this place come to sample the latest real ales so drinkers would tend to be in their thirties upwards. There is a reasonable amout of seating available and apart from Friday and Saturday evenings it should be possible to get a seat. The pub has two separate bar areas, one to the left and one to the right. The atmosphere is relaxed and friendly, service is good (although one Saturday evening only one person was working both bars and collecting glasses) and the pub does have a fair amount of character. Food is home-cooked and served lunchtimes and evenings until 8:30pm. 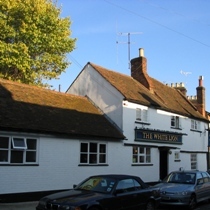 The White Lion probably has the best selection of real ales in St Albans; a very worthwhile place to visit.